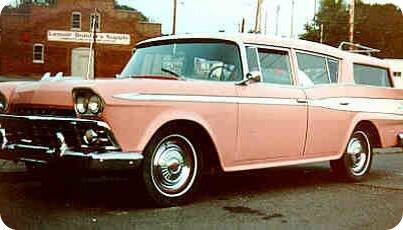 This is my friend/neighbor Dave dad's 1959 Rambler Cross Country Wagon. There are a lot of good memories associated with that car which is one reason I have for liking AMCs. Another reason for me to like AMCs is I always root for the underdog, which AMC certainly was. The biggest reason though is I like being unique. It is kind of sad when you go to a car show and 75% of the cars are either a Camaro, Chevelle, or Mustang. My first experience with a Javelin AMX was while I was walking to high school one day I spotted one in a fenced off yard and had a decent look at it. Only the rear of the dark gray car was facing me, I fell in love with those bubbled fenders, dual TV screen tail lights, and duck tail spoiler. Of course I didn't have the money to buy a Javelin however I did make a point of going to the local AMC dealer to look around. I almost bought a Gremlin but didn't have enough money for that either. A couple years after getting out of college I was still on an AMC kick. So off to the dealer I went. 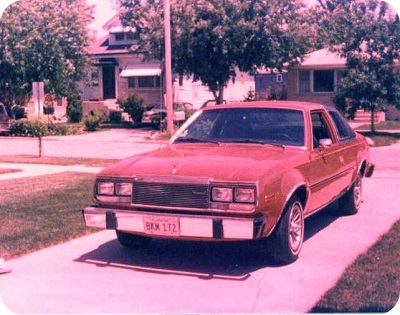 I went home from the AMC dealer with a brand new 1980 AMC Concord DL. Yep I was hooked on the AMC brand. Best car I ever owned. The VIN for the Concord is A0A065C274329. It was purchased on 5/31/1980 for $6,800.00 plus tax, license, and delivery charges it came to $7,330.50. The car was picked up on 6/6/1980. The car was purchased from Grand-Elm AMC/ JEEP Inc. 6940 West Grand Avenue, Chicago, IL 60635, phone 312-622-9244. The salesman was Jack Quillin. The color of the car is Cardinal red. The window sticker for the Concord has a base price of $5,493.00, $129 for the 2 barrel 258 six, $333 for the automatic transmission column shift, $45 for the resilient seat fabric, $794 for the air conditioning package, $76 for the power steering and power front diskc brakes, and $95 for the electric window defroster. Total options of $1,472.00. $261 shipping charge for a total sticker price of $7,226.00. By the way if anyone has this Concord send me an e-mail I would be interested in purchasing it.